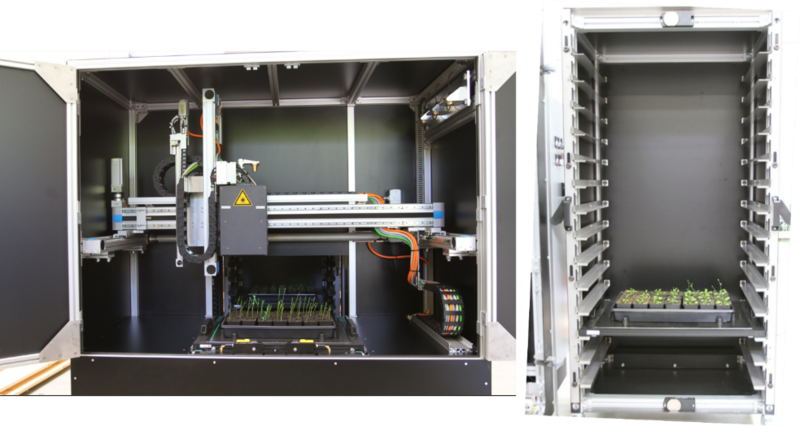 The LemnaTec PhenoCenter is the most rapid solution in phenotyping samples in trays. It brings advantages in phenotypic knowledge by combining PAM fluorescence (PAM imaging unit powered by Walz GmbH) imaging, hyper-/multi-spectral imaging, 3D scanning and imaging in visible and near-infrared range. Cameras move over a sample stage that can contain trays with pots or up to 18 multi-well plates, assessing large numbers of different samples in one run. 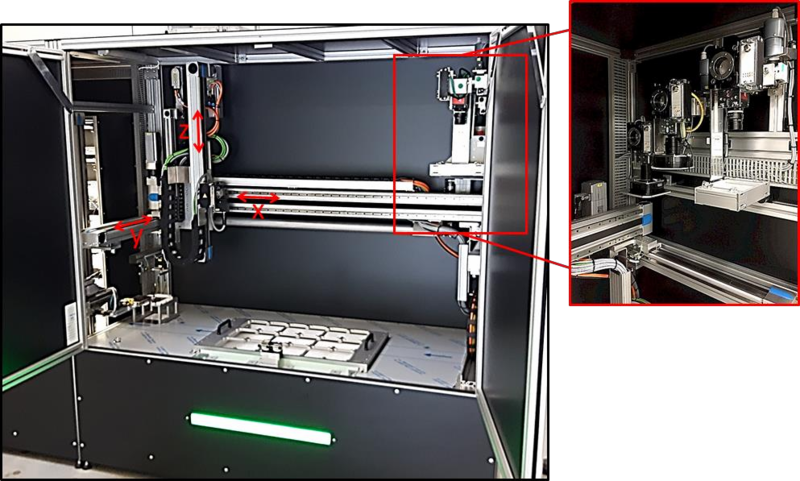 The closed cabinet of the PhenoCenter guarantees consistent and reproducible illumination and imaging conditions, suitable for the camera types supplied by LemnaTec. Lighting is adapted to camera requirements and sample properties. Different optical configurations are available depending on sample types. The Phenocenter Tray Provider accelerates sample measuring and saves labour. It is an accessory to the Phenocenter Base Module that allows temporally storing of sample trays in a trolley shelf system and automatic transport of all trays into the Base Module for measuring. Transporting in and out the trays, the Tray Provider enables automatically measuring phenotypic parameters of samples in a series of trays. The trolley shelves are loaded with sample trays by the users and connected to the Tray Provider unit. Thereafter, the Tray Provider works off all presented trays and users can attach further trolley shelves when finished. The trolley shelves have a series of slots for trays and can handle trays of different height, depending on the sample type. Lucia M. Acosta-Gamboa, Suxing Liu, Erin Langley, Zachary Campbell, Norma Castro-Guerrero, David Mendoza-Cozatl, Argelia Lorence, Acosta-Gamboa LM, Liu S, Langley E, Campbell Z, Castro-Guerrero N, Mendoza-Cozatl D, Lorence A (2017) Moderate to severe water limitation differentially affects the phenome and ionome of Arabidopsis. Functional Plant Biol. 44:94. The Phenocenter can be equipped with five different camera/sensor types, three of which can be mounted and operated at once. Manual exchange of cameras between experiments is possible. Phenocenters are delivered as standard with visible light cameras, all other camera types are optional accessories. The visible light camera takes photographs that can be processed for data on sample dimensions and morphology together with colour information. The laser scanner generates three-dimensional point clouds that can be processed for data on sample dimensions and morphology. The fluorecence camera takes single level fluorescence images that can be processed for fluorescence intensity. Fluorescence – depending on light and filter – refers to fluorescing substances in the samples, e.g. chlorophyll and its degradation products. 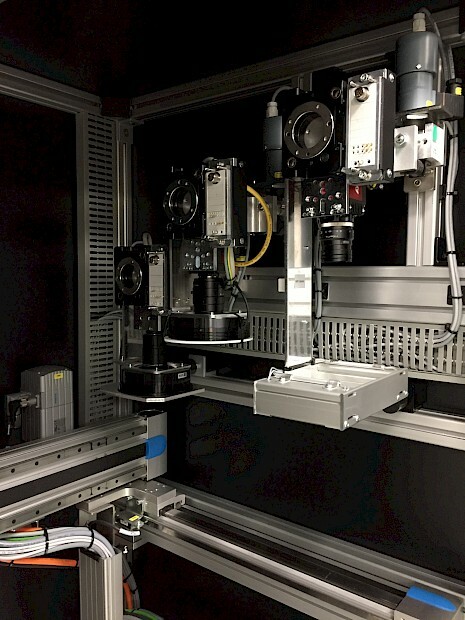 The chlorophyll fluorescence camera, a built-in Imaging PAM from Walz GmbH, takes dynamic chlorophyll fluorescence images that can be processed for photosystem II parameters. The near-infrared camera takes images of NIR-reflectance that can be processed for NIR intensity. With the 1450 nm narrow bandpass filter, signals relate to water content of the samples. Accessories for sample loading on request.